FHA, or the Federal Housing Administration, provides mortgage insurance on loans made by FHA-approved lenders. FHA insures these loans on single family and multi-family homes in the United States and its territories. It is the largest insurer of residential mortgages in the world, insuring tens of millions of properties since 1934 when it was created. 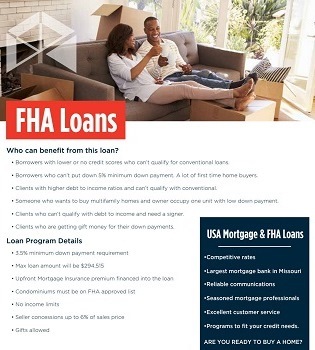 FHA Loans were designed with the first time homebuyer in mind and are mortgage loans insured by the Federal Housing Administration. They are generally easier to qualify for than conventional financing, allowing lower credit scores and higher debt-to-income ratios. FHA home loans require as little as 3.5% down but require an upfront mortgage insurance premium that can be financed with the loan, and monthly mortgage insurance. The up-front and monthly rates vary depending on down payment amount and loan term. With the minimum down payment of 3.5%, these rates are currently at 1.75% for the front premium, and 0.85% for the monthly mortgage insurance. Borrowers who can’t pay 5% minimum down payment. A lot of first-time home buyers. Someone who wants to buy multifamily homes and owner occupy one unit with low down payment. Clients who can’t qualify with debt to income and need a non-owner occupied co-borrower. Very recently HUD dropped the monthly mortgage insurance premiums from 1.35% annually, to 0.85% for 30 years fixed FHA Home Loans. With this change, or if rates ever drop to the benefit of the home-buyer, an FHA Home Loan can be easily refinanced through the Streamline Refinance option. USA Mortgage has many options for a simple FHA streamline refinance that do not require the borrower to credit qualify, or require a new appraisal.